H. FUJI Shioura, independent for Congress. Editor’s note: Mail-in ballots for the June 7 California Primary may be sent back in to the San Diego County Registrar of Voters any time after May 9. Registration for the primary continues as well. Escondido City Clerk Diane Halverson said Escondido voters could register through midnight Monday, May 23. For more information, call (858) 565-5800. Meanwhile, the 50th Congressional District might be 44 percent Republican, 31 percent Democrat, an anomaly in heavily Democrat California, but it has a lively race. Congressman Duncan Hunter Jr. is the Republican incumbent. Escondido real estate agent, and political newcomer, Patrick Malloy has been endorsed by the San Diego County Democratic Party. Also running is Democrat David Secor, who was blown out by Hunter in the last election, and Scott Meisterlin, a Republican whose website leads off with his photo, a giant U.S. flag and the “Serenity Prayer”. This June, I will be the only Independent candidate campaigning to become Congressman for the 50th Congressional District. Presently, there are four candidates running in this district, aside from myself, who are: David Secor (Democrat); Scott C. Meisterlin (Republican); Jeffrey P. Malloy (Democrat); and incumbent, Duncan D. Hunter, Jr. a Republican. Interestingly, the outspoken, Republican Presidential candidate, Donald Trump, and Congressman Hunter are apparently working in tandem. According to Politico, Congressman Hunter was the first member of Congress to endorse Donald Trump for President. Mr. Trump’s campaign website also acknowledges Congressman Hunter as being co-chair for the House Leadership Committee in Congress. This body directs the outreach efforts to recruit current members of Congress to support Mr. Trump’s campaign. California Primary is June 7. As a parent, youth pastor and educator, we all hope and pray they both change their policies after careful reflection, to a more realistic, humane understanding. The divisive, reckless, and disparaging rhetoric from Donald Trump will do nothing to assist us in reconciling and uniting as a nation. His demeaning speech, directed toward different people groups, also tarnishes our image abroad. As a San Diego native, I do not deem Congressman Hunter’s unilateral decision to endorse Mr. Trump as an accurate or honest reflection our diverse and growing 50th Congressional District. For example, Donald Trump’s isolationist proposal to build a wall at our southern border will not work…As a successful businessman, he is a closer; therefore, I feel Mr. Trump will say anything to get nominated for the Republican nomination. I am also concerned that Congressman Hunter is similar to his role model, Donald Trump, in that he will use tools of convenience in order to become re-elected. Sadly, they are both well-meaning and patriotic Americans. As Americans, I know we must be thankful for Mr. Trump’s past record in job creation, in general, in addition to Congressman Hunter’s service in the United States Marine Corps. I have prayed and contemplated carefully about my decision to run for office. I know I cannot remain silent, nor look the other way, when I discover wrongdoing and witness injustice. 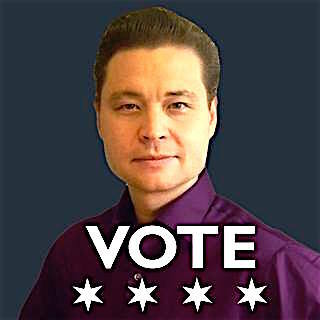 As the sole Independent candidate, I am obligated by conviction as a parent, youth pastor, educator, and technologist, to empower our voters, by not only organizing a campaign, but by calling for a movement. This is why I named my campaign website AmericaCalifornia.com, because I will do what is best for all of America, while also proudly representing the 50th District as a faithful San Diego native. Most importantly, I will not show bias nor partisanship once elected to office. I am an American first, and I will continue to act like one. For the people of the 50th Congressional District, I am here to get the job done. I believe this coming election has interesting, relevant and newsworthy issues that the public should be made aware of, such as the past actions of the incumbent to tacitly approve use of tactical nuclear devices on civilians (US NEWS & C-SPAN), collecting more campaign money from outside the state then from California according to Voters Edge, being a member of the Azerbaijan Caucus that lobbies Congress for their country’s self-interest and others, even while the Panama Papers by the International Consortium of Investigative Journalists have revealed starling corruption by their government and more. I will also remain true to our federal Constitution by working hard to protect and expand our First Amendment, Free Press Clause and Free Flow of Information Act. I will also play a vigorous role in making our government more transparent and accessible to journalists such as you, through the use of more time-efficient postings in social media. • Empower, inspire and facilitate residents’ questions that will be answered in a timely manner. • Volunteer to wear a GPS device during working hours, so voters may know how to locate me, to make it easier to meet me in person, so they may share their concerns. • Invite press agencies like the ICIJ (International Consortium of Investigative Journalists) to have a desk dedicated in my office on Capitol Hill and San Diego. • Deploy Facebook Live session in morning and closing of the day to inspire public input, Q&A and to offer a report summary to my constituents of my dealings of the day. • Explore the possibility of opening several more additional 50th Congressional Offices to better serve our community, in addition to our Washington DC, El Cajon, Temecula Offices. Be the first to comment on "Political notes featuring H. FUJI Shioura"